Floyd Mayweather's BUGATTI Veyron Grand Sport Vitesse Up For SALE For $2,350,000! - Muscle Cars Zone! Floyd Mayweather’s BUGATTI Veyron Grand Sport Vitesse Up For SALE For $2,350,000! As you already know Floyd Mayweather is really about his cars. He spent more money on his cars then most of the people will earn in their lifetime. He always pays in cash and he bought more than a 100 very expensive cars from one dealer. Floyd Mayweather’s BUGATTI is one of his best rides he ever owned. This time he is selling his very special BUGATTI Veyron Grand Sport Vitesse into auction block for $2,350,000. The car has some beautiful custom touches, it was driven by the boxing legend who never lost a fight and for sure will bring some good money, maybe this Veyron car worth even more then the current price. However, we could only guess why a man like his would sell anything, but maybe one of the reasons is because he would like to buy a brand new BUGATTI Chiron and renew his car fleet. What do you think? 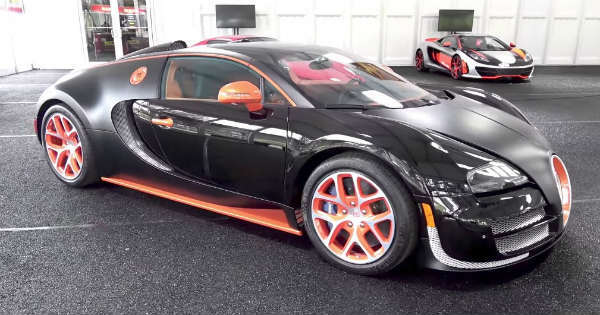 Check out the amazing video below and take a close look of this beautiful BUGATTI Veyron Grand Sport Vitesse in a matte black color and orange accents. Please share your thoughts about this beautiful car owned by the legend Floyd Mayweather in the comment section below and please don’t forget to share this post with your friends on Facebook.